Blog: What will it take to improve children’s life chances? What will it take to improve children’s life chances? This is the question posed by the Child Poverty Action Group’s (CPAG’s) new book, Improving Children’s Life Chances, which was introduced at an event hosted by the All Party Parliamentary Group on Poverty (APPG) and CPAG at Portcullis House, Palace of Westminster on 16th November 2016. In 2014-15, 3.9 million children (29% of children in the UK), were living below the poverty line. Under current policy conditions, projections indicate that this figure could increase by as much as 50% by the end of the decade. As was addressed by several speakers at the event, ensuring that families have enough money to live on is critical if children’s life chances are to be improved. This is because a lack of material resources may lead to families being unable to afford, for example, a healthy diet in pregnancy and for children, adequate heating, and children’s books and toys. Families living in poverty are also more likely to be living in overcrowded, damp, cold or mouldy homes. And poverty has a causal association with levels of stress, anxiety and depression, which impacts attachment and child development. For these reasons and others, Kitty Stewart, Associate Professor of Social Policy at the London School of Economics and Political Science (LSE), argued that it is essential that any life chances strategy includes a strategy for ensuring adequate family incomes. Kitty stated that this should include a focus on areas such as employment policy, childcare, housing, and crucially also, social security benefits. This is because wages at the bottom of the income distribution are never going to be sufficient to support the needs of households when they have children at home. The speakers also discussed other areas critical to children’s life chances. Eva Lloyd, Professor of Early Childhood at the University of East London, emphasised the importance of the early years and a good childhood for children’s life chances. Eva advocated a two-generation approach, combining high quality early years childcare provision and support for parents to improve the home learning environment. Angela Donkin, Deputy Director of the Institute of Health Equity, discussed the impact of income on levels of parental stress and depression, child attachment and cognitive development, and in turn, mental health and behavioural problems. Angela noted that one in five children have a mental health problem at any one time and that children in the poorest households are three times more likely to have a mental health problem. Angela also discussed the impact of income on child birth weight and physical health problems such as obesity. In their book Improving Children’s Life Chances, CPAG recommended that a life chances strategy include: a commitment to improving health outcomes by reducing socio-economic deprivation; high quality universal antenatal and maternity services, with additional targeted support for mothers that need it; and the recognition of children’s mental health as a public health priority, backed by investment in support for children and families, starting before birth. CPAG also recommended that there should be more flexible models of care and partnership working by child and adolescent mental health services, and a local commissioner accountable for children’s mental health. 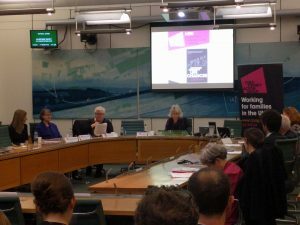 Dr Sylvia Tijimstra, Policy Analyst at the Salvation Army, linked the findings of CPAG’s book to the experience of the Salvation Army in communities across the UK. Sylvia spoke of the high levels of insecurity in communities across the UK and the high level of demand for support and advice, including employment support, debt advice and welfare advice. She asked who is responsible for providing this advice and called for greater clarity regarding who is meant to be providing what.